Bala Ambati, MD, PhD is on the Board of Directors of JNV. He has the distinction of being the world’s youngest person to graduate from medical school at the age of 17. He is experienced in cornea transplants, cataract extraction, keratoprosthesis (artificial cornea), LASIK, and other complex procedures of the cornea and anterior segment of the eye. He also practices general Ophthalmology. He has been an invited speaker at the World Ophthalmology Congress, American Society of Cataract & Refractive Surgery, International Congress of Eye Research, and other national and international conferences. He regularly donates his time overseas on missions with ORBIS, a nonprofit organization with a Flying Eye Hospital. With respect to clinical research, Dr. Ambati is committed to constant analysis of results of cornea transplants, LASIK, cataract extraction, and other anterior segment procedures with a view towards optimization of patient outcomes. 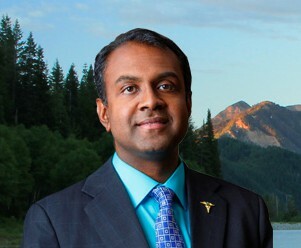 He also serves as the official Utah Utes team ophthalmologist. For more information, visit Dr. Ambati’s official website here.